Compact panel bridges, or bailey bridges, are a type of portable, pre-fabricated, truss bridge. They are known for their convienent transport, speedy erection, and easy disassembly. Because of this they are adopted extensively and one of the most popular bridges in the world. Compact panel bridges are light-weight and made of high tinsel strength steel. This gives them great stability in addition to a heavy load capacity. They are known for their long lasting fatigue life as well. Compact panel bridges are capable of altering their span in order work in a variety of settings. 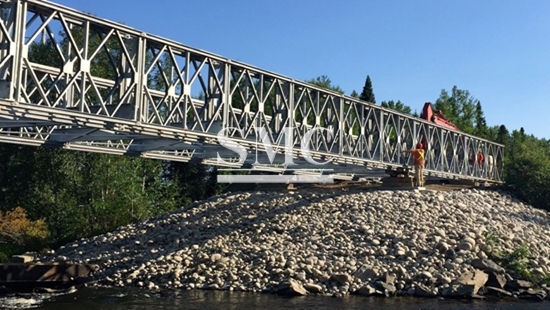 Compact panel bridges work well as temporary bridges, emergency bridges, and fixed bridges. Here at Shanghai Metal Corporation (SMC), we have the highest national qualifications to assure quality and safety in our compact panel bridges. Our compact panel bridge was co-developed in a lab in partnership with a university. We also have have 3,000 employings working to ensure an on time delivery and customer satisfaction. Compact panel bridges are known for their easy trasportation and assembly. They are composed of a light weight main beam. This main beam is connected to the panels by connection pins. These are then assured by the 3m panel. Compact panel bridges can be launched in a couple of methods. They can be slid or rolled from the abutment or lifted piece by piece by craines or stand jacks. Sometime they do require a combination of erection methods. This is called a hybrid scheme. Most times their components and beams are small and light weight enough to be transported in the back of truck beds. They can be assembled quickly and can even be done overnight to minimize distruption. The history of the compact panel bridge dates back to World War II. Donald Bailey, is accredited with the invention, hence the name “Bailey Bridge”. Bailey was a civil servent in the British war office who tinkered with bridges as a hobby. He presented his idea to the British Royal Army and they began making a prototype at the Military Engineering Experimental Establishment in 1941. However, the completed concept was not completed until 1942. By D-Day in 1944 several compact panel bridges were available and ready to use on that monumental day in history.